As a kid, collecting things is just cool. Baseball cards used to be where it was at. Then there was Magic the Gathering, Pogs, and Pokémon for kids and adults to geek out on. Skylanders Spyro’s Adventure was a toy/video game hybrid that was pure genius in terms of getting kids and their parents to buy into the collecting urge. With 40+ toys to collect, the developer Toys For Bob and publisher Activision had turned a storied but near dead franchise into a money maker. Like all things collectible, the new series of toys are out and a new video game to go with them has arrived in the form of Skylanders Giants. While not fundamentally different than Spyro’s Adventure, Giants brings a more polished product that should delight collectors. The Starters pack for Skylanders Giants comes with 2 Skylander figures, 1 Giants figure, and the newly modeled Portal of Power. Spyro’s Adventure used a wireless battery-powered Portal that might be the single cause for a battery shortage during the zombie apocalypse. The new Portal is tethered to a USB cord that plugs into the console. While the game can be beaten with the 3 characters that come with it, Activision wants you to go out and pick up the new 40+ Series 2 figures. They probably also wouldn’t mind if you went back and got the other 40+ Series 1 figures on top of that. Buying additional figures allow you to play them in the game by placing them on the Portal of Power and unlock hidden areas based on the figures type. Each character has their own unique abilities and play style. The cool thing about Skylanders is that the figure keeps track of its stats and game progress. If you take your favorite figure over to a friend’s house, it can be imported into his game as a guest with all the upgrades and customization that you had on that character in your game. Series 2 figures were made for Giants but that doesn’t mean those that own figures from Series 1/Spyro’s Adventure can’t use them in Giants. All of the characters can be played in Giants with their stats and customizations from Spyro’s Adventure plus they have the ability to level up from 10 to 15, the new level cap in Giants. Skylanders plays like a mixture of hack and slash RPGs with the aesthetic of classic PS1 and 2 platformers like Crash Bandicoot, Jak and Daxter, and Ratchet and Clank. Players go around maps smashing objects, killing enemies, solving puzzles, and collecting phat loot. Skylanders has different types of characters that solve puzzles suited towards their type. For the most part these types are based on elements. Skylanders Giants introduces a new character type, Giants, to the mix. Giants are a bit of a hybrid type. They are typed Giant but also can be one of the other types like Life. Giants are a bit of a beast in terms of gameplay. While feeling slow and cumbersome, they absolutely devastate enemies…bosses included. Difficulty was a criticism of the previous title, and with the inclusion of Giants it will be once again. But the target audience must be taken into account, and the low difficulty creates an optimal game for kids and their parents to play together. The plot is rather simple in Giants but kid friendly with enough family friendly subtle humor to keep adults entertained. After being banished to the realm of Earth, Kaos strikes back at the Skylanders via Portals of Power in the real world. 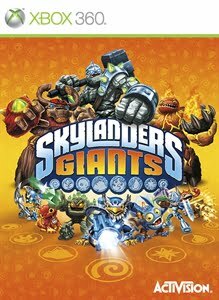 The Giants were the original Skylanders that had been frozen as toys on Earth and it is up the players to utilize them and the other Skylanders to save the Skylands in a breaking the fourth wall kind of way. Great voice acting is where the humor can be found as all of the Skylanders are voiced now rather than speaking a meta language as in Spyro’s Adventure. It is easy to see where in the future, Skylanders games will be like Disney animations with a who’s who of celebrity voices. The campaign is not the only mode in Skylanders. There is also a battle mode that enables players to go head to head with each other in arena style battles that feel like a 3d open Smash Brothers. There are four rule sets that vary up the Skylander on Skylander action. Ring Out has players building up power via attacking until they can execute a special move that knocks the other player out of the ring. Sky Gem Master has players focused on collecting 5 sky gems before the other player. Skygoal plays like single capture the flag but with an American football and field goals. Arena Rumble is just a straight up fight to the death with power-ups and hazards. Skylanders Giants was created to sell toys and make Activision some bank. They could have released a lackluster game as we have seen done by so many in the past to cash in on the kids. Thankfully, they did not do this and actually released a game that adults and kids are proud to have in their collections. We all know that Skylanders is a cash grab but in the end the experience and joy of collecting make it all the worthwhile. The formula for Giants hasn’t changed much from Spyro’s Adventure but brings with it enough content to be worth the upgrade. Hopefully Skylanders does not go the route of other franchises like Tony Hawk and Guitar Hero and flood the market.